1 of 1 In a small saucepan, stir together the sugar and cornstarch. Stir in berries and 1 tablespoon water and heat over medium heat. Cook 9 to 10 minutes, until thickened, bubbly and most of the berries have popped. Break up remaining berries with a spoon. Remove from heat; cool. 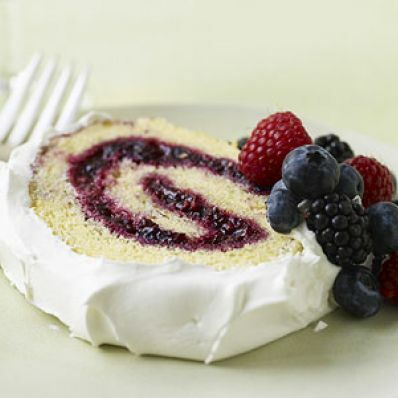 1 of 4 Coat a 15 x 10 x 1-inch jelly roll pan with nonstick cooking spray. Line bottom of pan with parchment or waxed paper. Spray paper. In a medium-size bowl, stir together the flour, baking powder and salt. In a large bowl, beat the eggs with an electric mixer for 5 minutes, until very light yellow. Add granulated sugar in batches, beating until smooth. Beat in vanilla extract. 2 of 4 Fold flour mixture into egg mixture until no lumps remain. Pour into prepared pan, spreading level. Bake at 350 degrees F for 12 to 14 minutes or until lightly browned. 3 of 4 Meanwhile, dust a clean kitchen towel with confectioners' sugar. When cake is done, turn out onto towel. Roll up towel and cake; cool completely. 4 of 4 Unroll cake; spread with filling. Roll up again, without the towel. Frosting: Transfer cake to a platter; spread with thawed whipped topping. Slice and serve.